And the winner is... Rihanna! Pussycat Doll Nicole Scherzinger and Ms. cat-scratch-cleavage, Eve, present the Moonman for Monster Single Of The Year. Shia LeBeouf's shorty thanks the rain for keeping her "Umbrella" in business after taking Monster Single Of The Year. No, it's not Paula Abdul and Simon Cowell as teenagers... 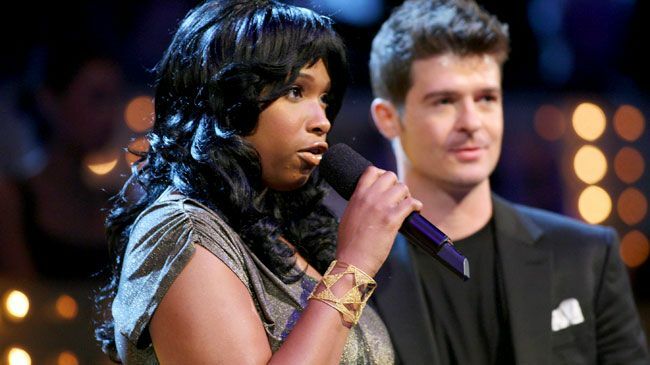 It's Dreamgirl Jennifer Hudson and throbbin' Robin Thicke announcing the nominees for Quadruple Threat Of The Year! 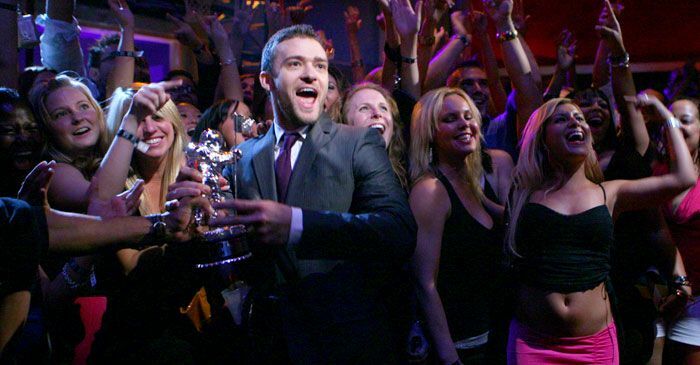 Is it just us, or does this photo of Justin Timberlake winning Quadruple Threat Of The Year in a sea of barely-dressed blondes scream "PULITZER?" 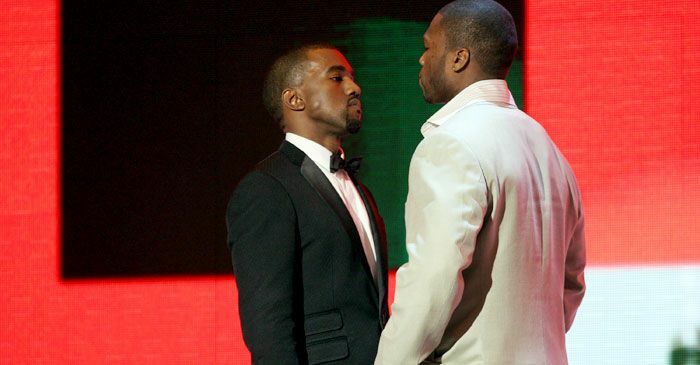 The sexual tension between hip-hop heavyweights Kanye West and 50 Cent, both of whom are releasing new albums on 9/11, nearly comes to a head as they team up to present the VMA for Best Collaboration. Get Jay-Z out here! 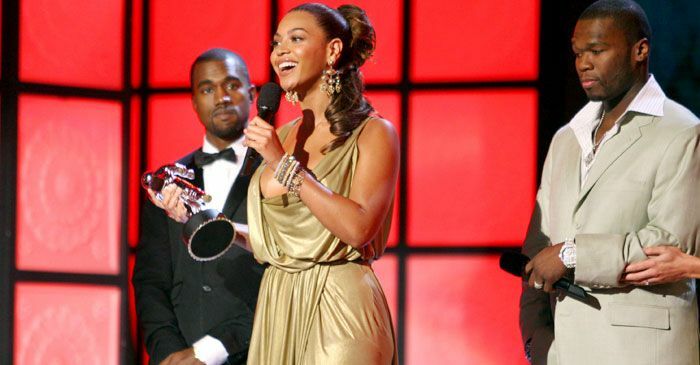 Kanye West and 50 Cent go googly-eyed as the beautiful Beyonce accepts the Moonman that she shares with Shakira for Best Collaboration. Hello, body language! Lauren and Audrina subconsciously freeze Whitney out as the three 'Hills' stars announce the Male Artist Of The Year. Drrrama! Yeah it's gotta be real cool to be Justin Timberlake, but can you imagine being his mom tonight?! Here he is goofing around with Timbaland as mommy swells with pride. "Hey, Rihanna, step away from The Academy Is..." 'TRANSFORMERS' star Shia LeBeouf announces the nominees for Best Female Artist. Mary J. Blige now pronounces Rihanna and Dr. Dre man and... wait a minute! They're just handing over her Moonman for Video Of The Year. Rihanna accepts her Video Of The Year Moonman as Kanye West stomps out of the auditorium and slams the door behind him.